Looking for a Thanksgiving 5K in San Diego? Father Joe’s Villages’ Thanksgiving Day 5K gives families and friends a chance to enjoy the magic of giving back on Thanksgiving morning. 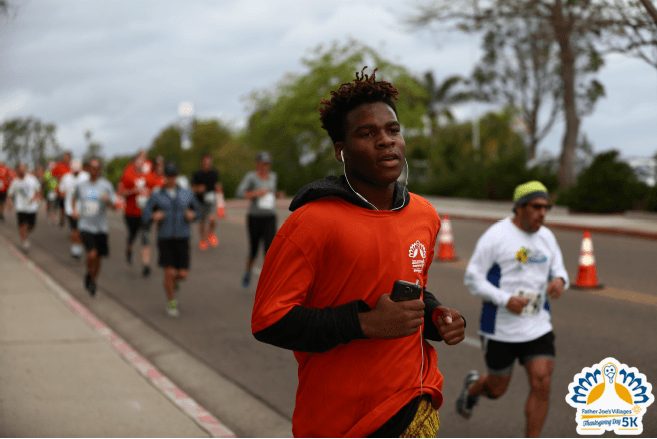 Find out how participating in the 5K can help feed hungry San Diegans in need. On the evening of Thanksgiving, many of us join together in the homes of loved ones to enjoy a delicious meal. Surrounded by family and friends, we take turns saying what we are most thankful for. Imagine if you didn’t have a warm home or a family to spend the evening with. Imagine if you hadn’t eaten in days. This is the reality for many people experiencing homelessness in San Diego each Thanksgiving. Participants in the Thanksgiving Day 5K are helping Father Joe’s Villages provide over #1MillionMeals a year to hungry neighbors in need. That’s why the 5K works to feed hungry San Diegans in need. Each day, thousands of our homeless neighbors in need benefit from the meals served in the Franklin Antonio Public Lunch Program. Our Food Services Program is just one of many programs at Father Joe’s Villages working to support the homeless community. Before filling up on Thanksgiving dinner, why not bring the family to Balboa Park and advocate for those experiencing poverty and homelessness in San Diego? Nearly 480,000 San Diegans struggle to put food on the table and more than 160,000 of those suffering are children. Each year, the Food Services Program at Father Joe’s Villages works to serve more than 1 million meals to homeless men, women and children living in San Diego. We provide three daily meals to the residents of the Village. Plus, we provide a nutritious daily lunch for community members in need. Our Food Services Program operates 365 days per year and uses more than 18,000 pounds of food each day. The Thanksgiving Day 5K is not only a fun run/walk around scenic Balboa Park. It’s also a meaningful way to give back. It generates awareness and funds to help support Father Joe’s Villages’ efforts to provide and serve approximately #1MillionMeals each year. Proceeds from the Thanksgiving Day 5K go toward Father Joe’s Villages’ Food Services Program to continue feeding those in need. Join us on November 22, 2018. Join participants of all ages as they follow the iconic, dog-friendly route through Balboa Park to reach a family-friendly festival at the finish line. Following the morning run/walk, the group will enjoy a live blues band, refreshments, a beer garden and a costume contest. Canine participants are welcome in the festival’s dog area, while children can get creative with crafts and meet their favorite Disney-inspired characters. You can even purchase a pie baked by our Culinary Arts Program students to take home for a Thanksgiving dinner dessert. Spend your Thanksgiving morning giving back! Help support Father Joe’s Villages Food Services program. Join our mission to provide #1MillionMeals to thousands of neighbors experiencing homelessness in San Diego. We’ll see you at the run.